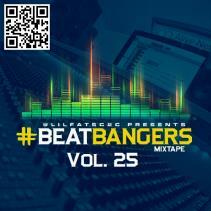 Please help promote the mixtape by going to Coast 2 Coast Mixtapes Presents: #BeatBangers Mixtape Vol. 25 and click the Facebook Share button on the page to share to your Facebook friends, then click the Tweet button on the page to simply share the mixtape to your Twitter followers. MAKE SURE TO COME BACK AND SUBMIT A NEW SONG EVERY WEEK TO KEEP GETTING MIXTAPE SPOTS! Become a Coast 2 Coast Premium Member and get 5 Sponsored Submissions Per Month + Radio Spins & More for only $25!